Welcome from the Briski family to the 3rd Annual Alexis Briski Memorial Softball Tournament. My name is Kael Briski, Alexis’ father. I wish it wasn’t true, but the reason that we have the Alexis Briski Memorial, is that my daughter Alexis was diagnosed with a children’s bone cancer known as Osteosarcoma in May of 2008. A year later on May 23rd, 2009, her life on earth ended; she was 11 years old, just 24 days shy of her 12th birthday. Alexis played softball in our league beginning in 2005 and through the 2008 recreational season. Our league chose to honor her by re-naming the tournament in her memory. We think of her as an angel that lives in our hearts, and is with us every day. She walks out on to the field with us for every game, and encourages the girls that play this sport to go out and give it everything that they have. The fact that this is the third annual tournament has some special meaning to us. #3 is the number that Alexis wore playing for our Magic teams. Alexis was eternally optimistic. In the sport of softball, there was really only one thing that made her mad. That was when a teammate told her or other members of the team that they were “going to lose.” That never sat well with her even though the 10C team she played on in 2007 won a total of 2 games. She always believed there was an opportunity to win the game. This attitude served her well when she was diagnosed with cancer. Osteosarcoma is a kind of cancer that grows in the bone…it is said to be one of the most painful forms of cancer. Alexis’ cancer was discovered in her upper left arm after she complained of pain in that area. In order to have any hope of cure, it was necessary to take out all of the cancer. That meant taking out the bone in her left arm from her shoulder all the way down to just 4 cm above her elbow. It was replaced by a donor bone, and with plenty of screws and plates, her surgeon was able to give her back an arm that was functional but with much of the muscle taken away. That didn’t stop Alexis. She still dreamed of playing softball again, and even when her left arm had to be amputated on May 1, 2009 because the cancer had come back with a vengeance, she still believed she could play the game. We were encouraged by a family that we never met-they were from Georgia-that had heard about Alexis. They sent us a letter and told us of a boy that had his arm amputated and was the best pitcher and hitter in his Little League there. If he could do it, why not Alexis? That’s only a small slice of Alexis’ life and hopefully gives you an idea about who Alexis was, and how she handled her disease. Since Alexis passed, we’ve had some experiences in our family where we believe Alexis has made her special presence felt. Though there are a few of these stories, we’ll share just one since it relates to softball , and let you decide whether you think it is coincidence, or something beyond that. Recently in June of 2011 I managed our 10B Magic team and we were playing in the NorCal tournament at Twin Creeks in Sunnyvale. Alexis’ sister Annika wears the number 10 jersey on that team. We lost our first game in NorCals and won our second game, which was played on Saturday at 8:00 a.m. Our next game being at 4:00 p.m., Annika went home to rest. Uncharacteristically, she washed her jersey. However, the power went out as she was doing it, and the jersey was stuck-locked in the washing machine. She called me as I was still at the field and told me. She asked if she could wear Alexis’ #3 jersey. So of course… yeah, put it on. It is the first and only time she has ever worn it. Annika arrived for our game wearing Alexis’ #3 jersey. It was the third game we played in NorCals. In the third inning of the third game, Annika game up to bat with three runners on base. The result was, she hit a triple from the #3 spot in the batting order. Annika didn’t take off the number 3 for the rest of the tournament. We won that game and kept on winning all through the loser’s bracket to take…. 3rd place in NorCals. So this year I’ve titled my letter to you “Hey Hey Hey Hey #3!” If you’ve been out to any softball tournament you will hear a lot of cheering. One of our favorites is the cheer that goes: “hey hey hey hey #3!....we’ve got our eyes on you…and what we like most of all…..it is the way you hit that ball….the way you smack that ball….the way your cream that yellow green ball…I said tattoo that ball…tattoo that yellow green ball.” It is a great way to remember Alexis. We are glad that this tournament has taken on some meaning to the girls that play in it. In years past our family has been presented with gifts, flowers, and given cards from the various teams in our tournament. We’ve seen teams put on their own yellow ribbons in honor of Alexis. We thank them, and all of the dedicated softball players, and their parents, coaches, and fans who come out every year to make this a special tournament. 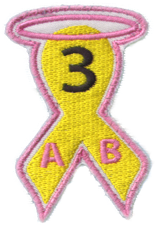 You’ll see me out there coaching one of our Magic 12U Fall teams wearing my Magic hat with that same yellow ribbon patch and also on the other side a purple “J” for one of Alexis' best friends, Jensen Barrett whom she met in the hospital and who suffered from a very similar kind of cancer. Jensen passed away a year ago. She was a fine athlete fantastic person and great friend. We’d also ask that you remember the Chiala family of our league, whose infant daughter Chelsea unexpectedly died of SIDS in December of 2010. Please consider and remember what a real treat and privilege it is to enjoy this sport and be happy and healthy. The Briski Family wishes to especially thank our league for all the support it has given us over the last few years. We welcome you to this 3rd Annual Alexis Briski Memorial and wish you the best.